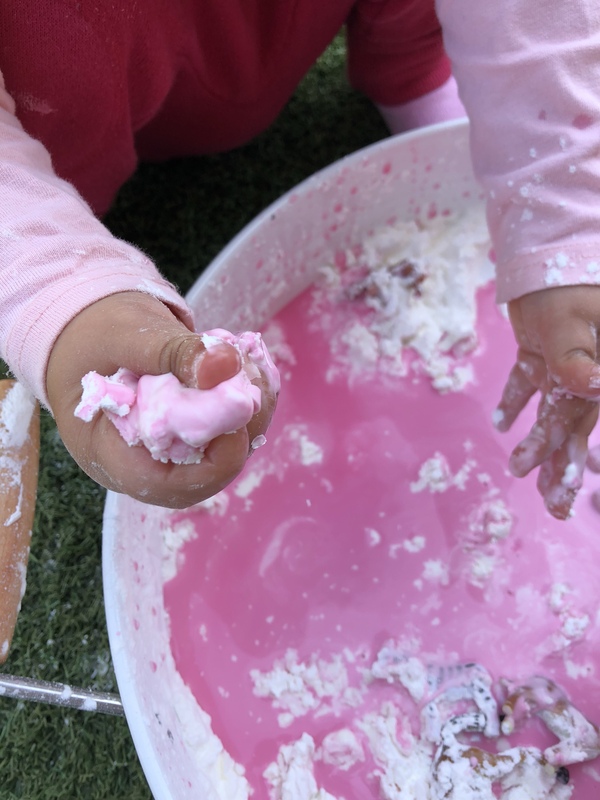 If there is ever a time when I need to choose a sensory medium that will be the last we will ever have in the world, it would be Oobleck. It is such a captivating medium! I often find myself still running my fingers through it long after the kids have finished. 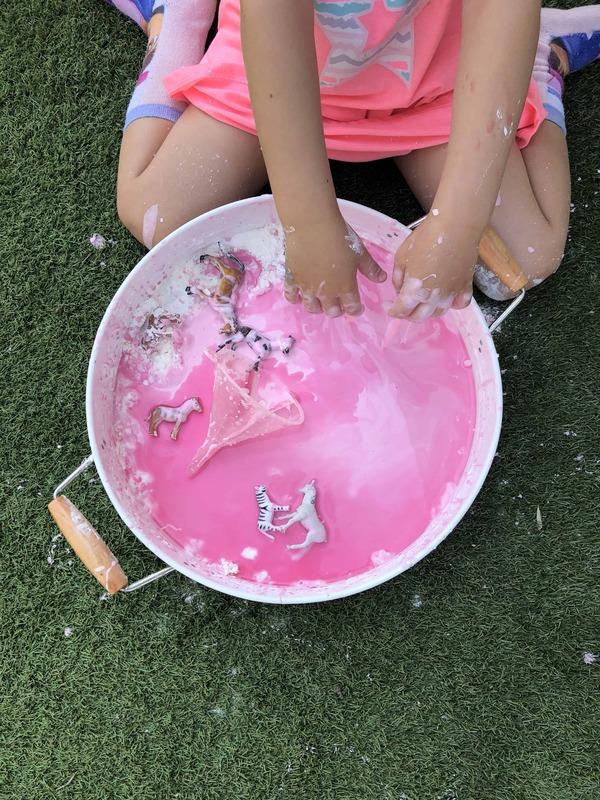 Now Oobleck isn’t just any old liquid. It is special. It is neither a solid nor a liquid! Yes, it shares properties of a solid AND liquid. This makes it fall under the category of being a non- Newtonian fluid. 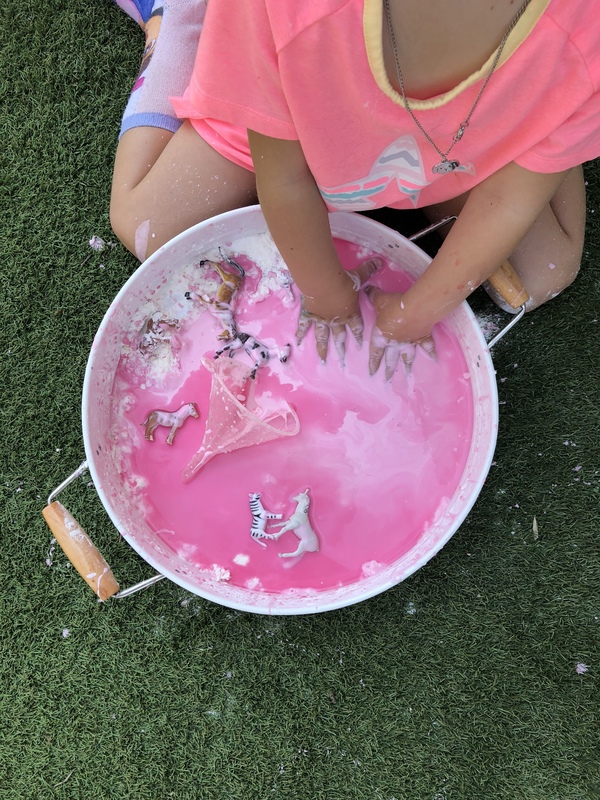 Under pressure, Oobleck is hard and mouldable however once the pressure is removed, it flows like a liquid! 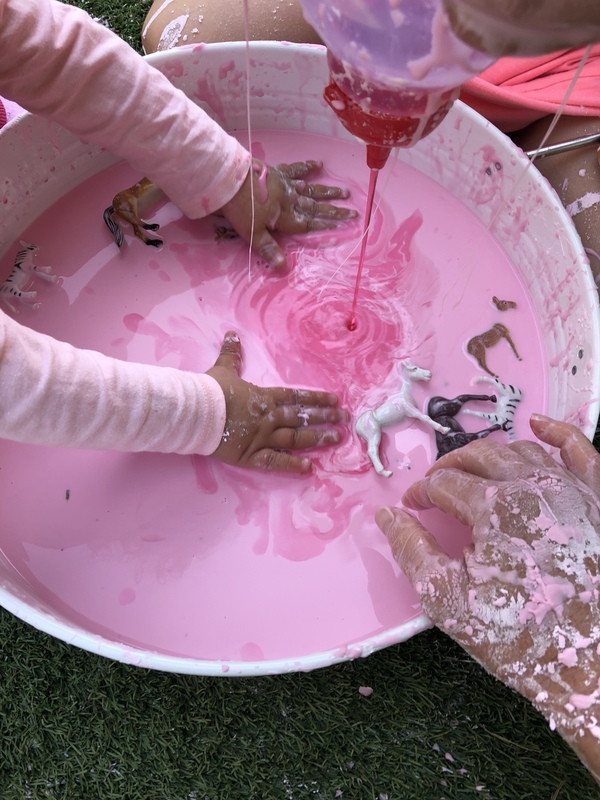 Now you might wonder, why call it Oobleck? 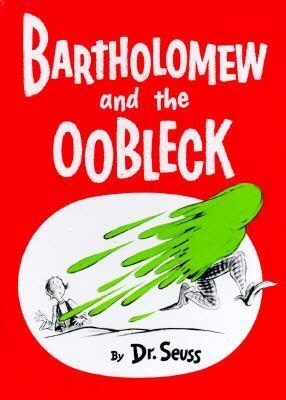 Dr Seuss’ Book ‘Bartholomew and the Oobleck‘ is why! So how do you make this mind blowing substance? It’s SOOOO easy! Here is how we do it. 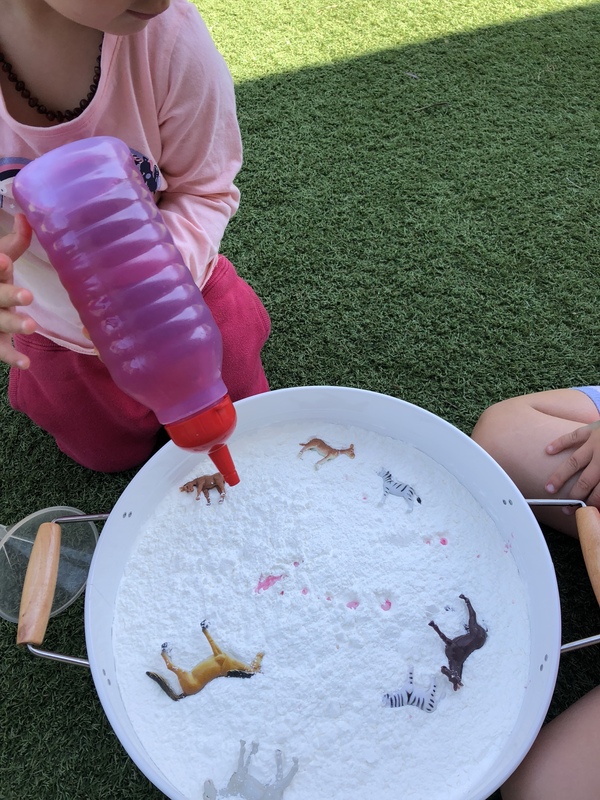 I covered our round tray with corn flour and added a splash of food colour to a squeezy bottle before filling it with water. 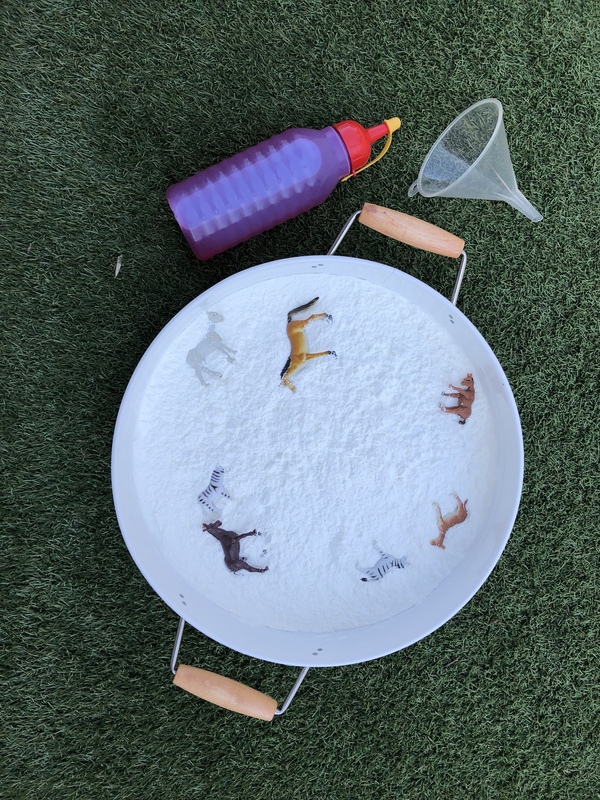 The horses and zebras were thrown in just because… they could be used to stir, mix and scoop or be used to inspire a creative story. 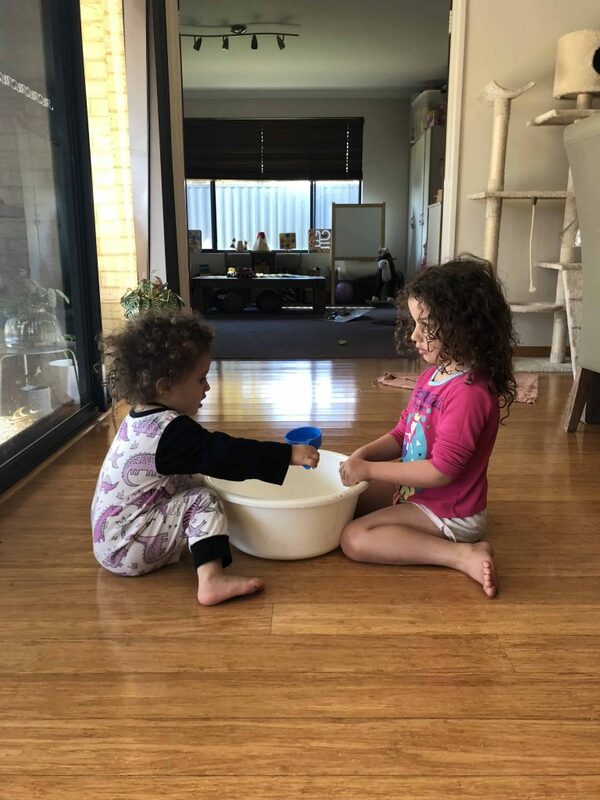 Miss 19m was handed the bottle and given the honours of being the first to squirt some water into the tray. 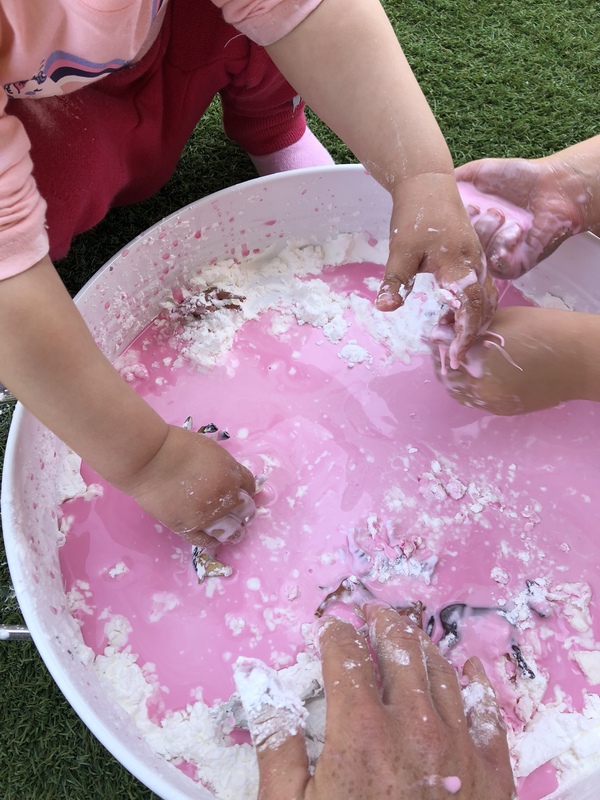 Her small fingers wrapped around the bottle and with a squeeze, the fluid splashed into the tray and bounced off the corn flour before settling into small pools on the surface. 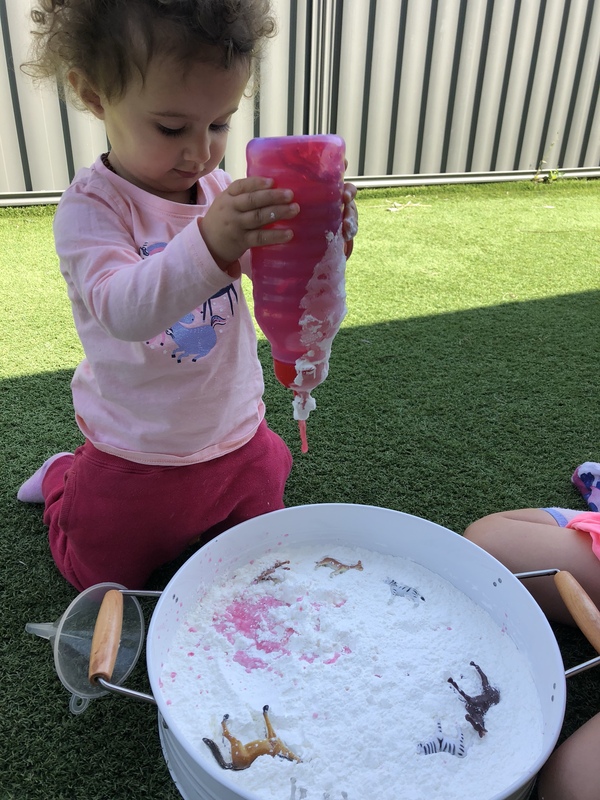 Miss 19ms attention drifted thrusting a plastic funnel into the corn flour. She was rewarded with a plume of the powder floating off into the breeze. Miss 4 eagerly took charge of the water bottle and generously squeezed it into the tray. The small pools quickly became larger ones before joining together. We started to run our fingers over the liquid, mixing the flour in consealed underneath. 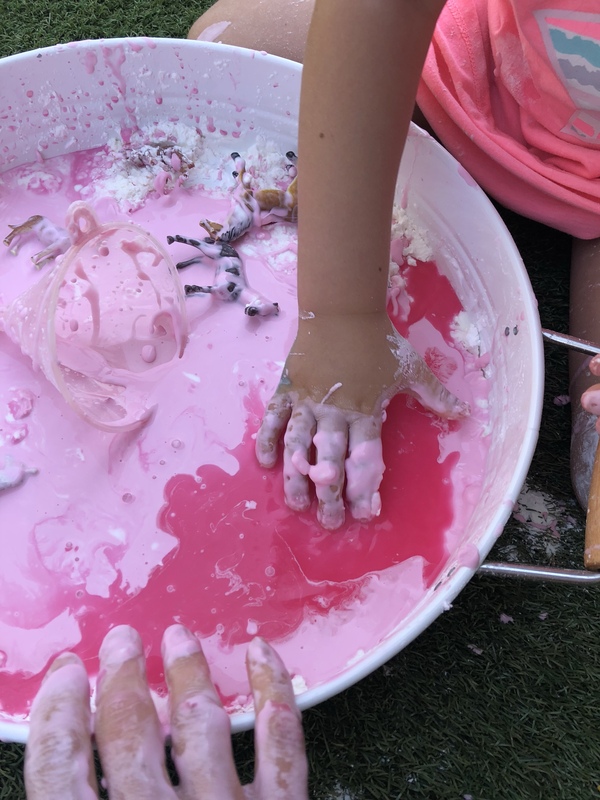 Our oobleck was coming together nicely! Scraping the bottom of the tray, we retrieved handfuls of the mixture. Squeeze it and keep it moving, the mixture stays hard. As soon as you stop applying the pressure, the once hard ball liquifies and drops through your fingers. As our Oobleck slime began to dry out, we simply just squeezed more water into the tray and continued playing again! 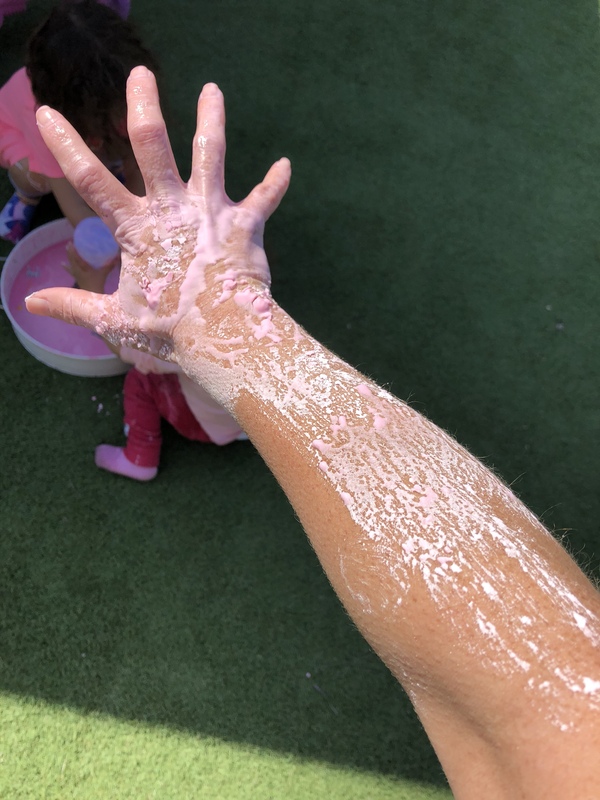 As the Oobleck dried, it left pretty patterns in our arms, grass, Miss 4’s hair and everything else within a 2 metre range from where we’re playing. Luckily, it washes clean just as easily as it is made- phew! 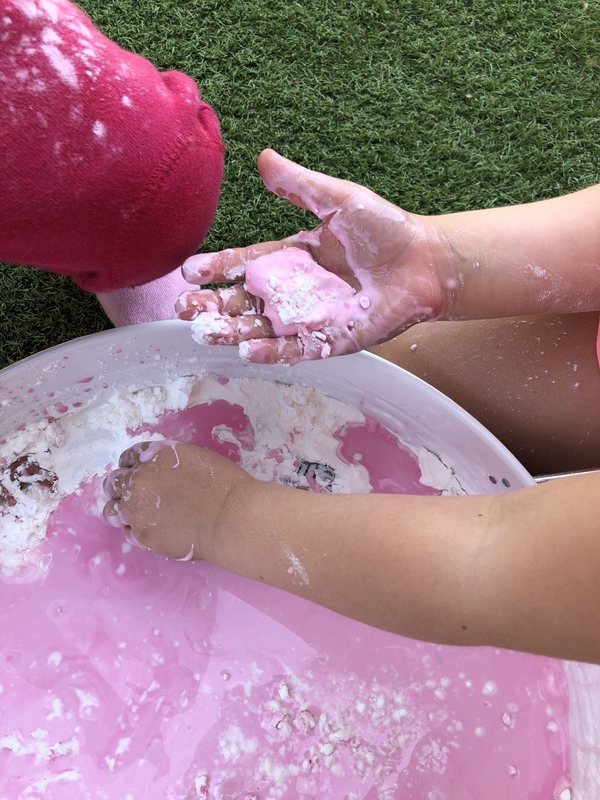 It’s safe to say that this non-Newtonian fluid is a favourite slime at our house. Give it a shot and let us know what your family think of it! You make it look so simple! I hope it is because I have babysitting duty next weekend and I definitely plan to let them tire out by having a blast throughout the day. Thanks for sharing the instructions! 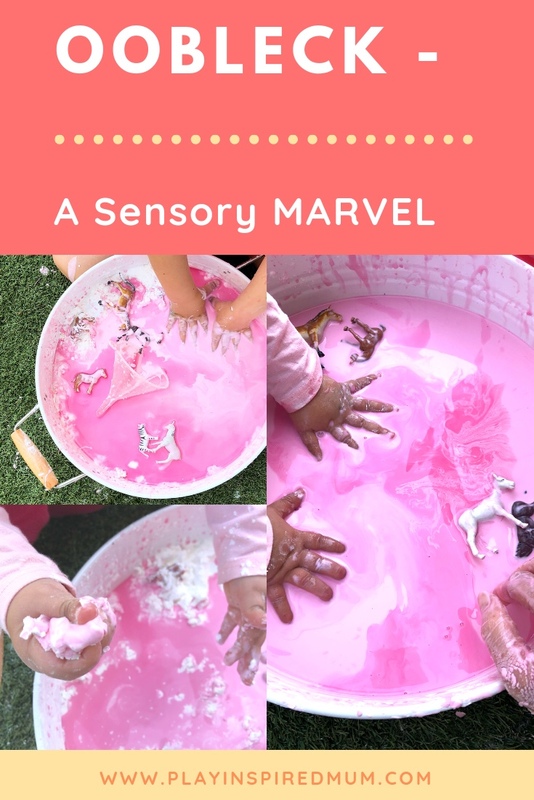 What a perfect sensory activity for preschoolers! I love how it only needs a few ingredients. I will have to make some this weekend. 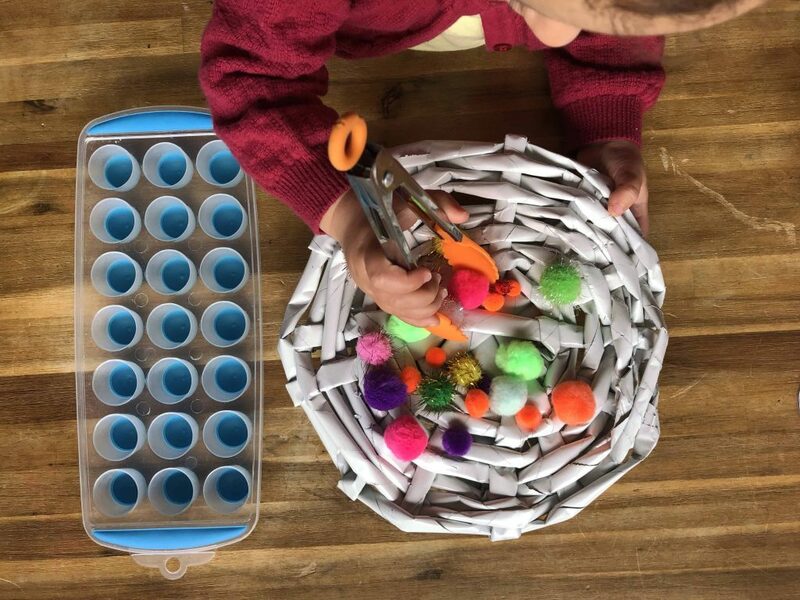 My kiddo is no longer a preschool, but I think she will think it’s a cool experiment. Wow! This is so cool and creative, and I bet the kids had a blast playing and learning from it. 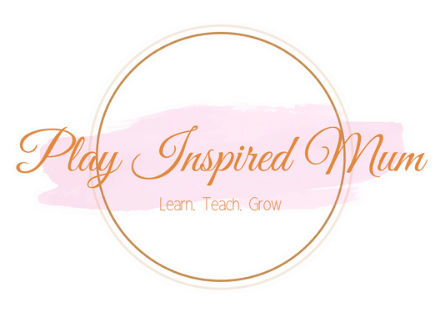 An excellent idea and learning experience. 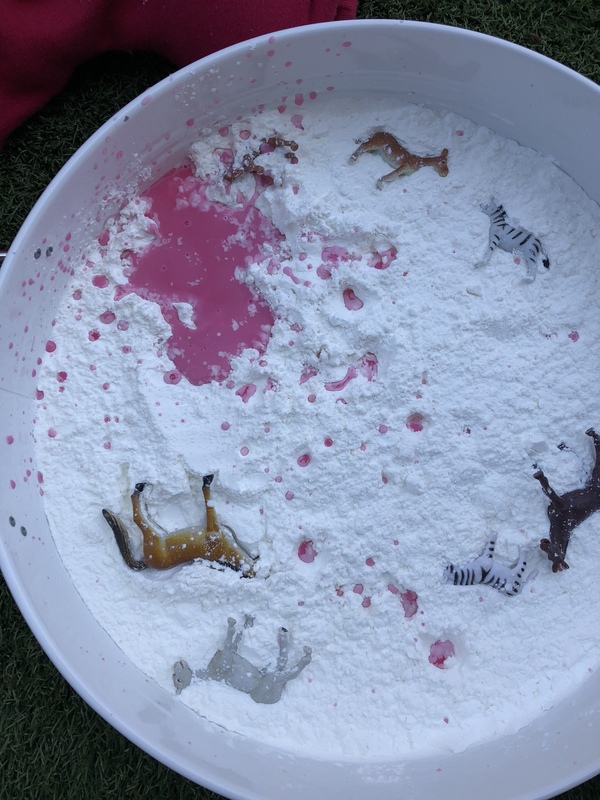 I loved the idea of the animals in the mix. What a cute idea. 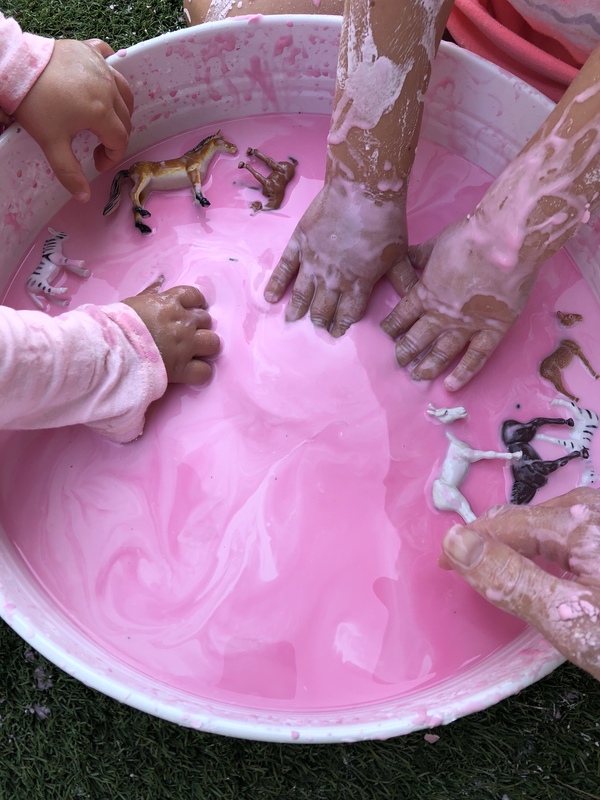 Seriously this looks so fun, I want to make Oobleck and play myself. I love how it’s made with so few ingredients. This is a fantastic idea! 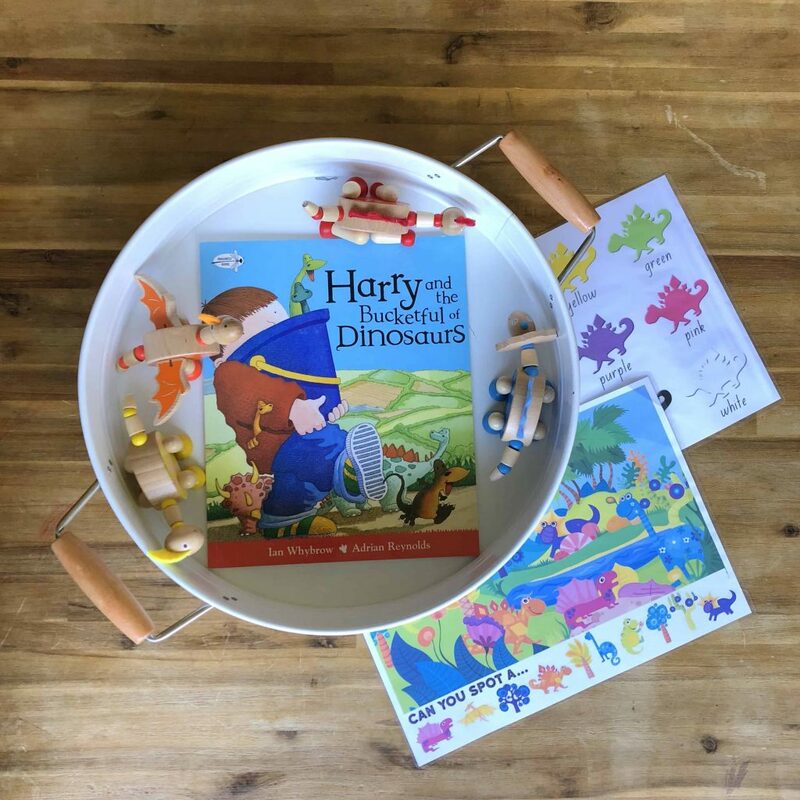 I wonder if you could use some old fossils or make some pretend dinosaur bones to recreate a sort of paleontology experience for children with this? I know a lot of kids who would love that! how interesting is this! im can easily imagine how kids would enjoy this! My two-year old would be ALL over this!!! She is obsessed with making messes. If we have any more warm days this fall, I might have to make this with her. If not, we will do it during the Spring. I need to remember this post so we can do it. This is totally fun. 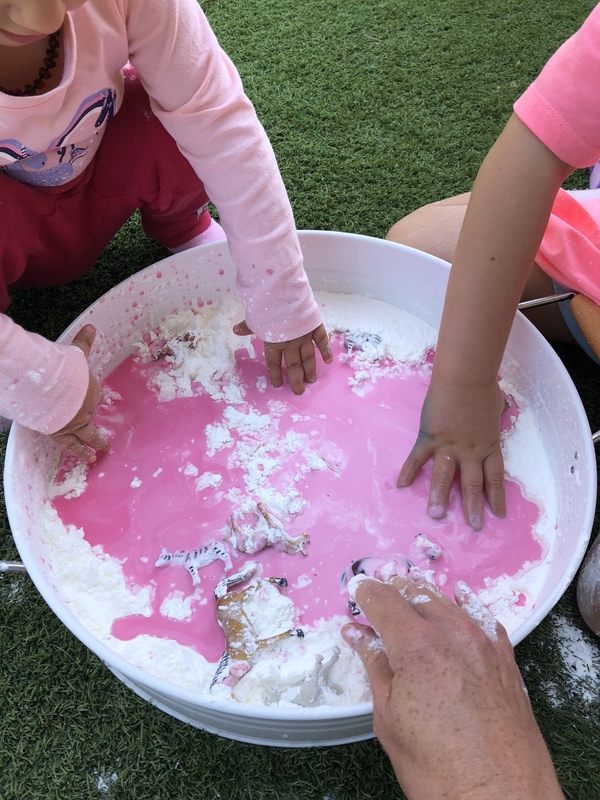 Looks like kids had a great time and they enjoyed this activity. Thanks for sharing the idea and instruction too. Will definitely going to try this for sure with my kids. It’s definitely a great activity together with your kids. This is perfect for all ages. Well time spent amd super fun. Oh my daughters would love this! 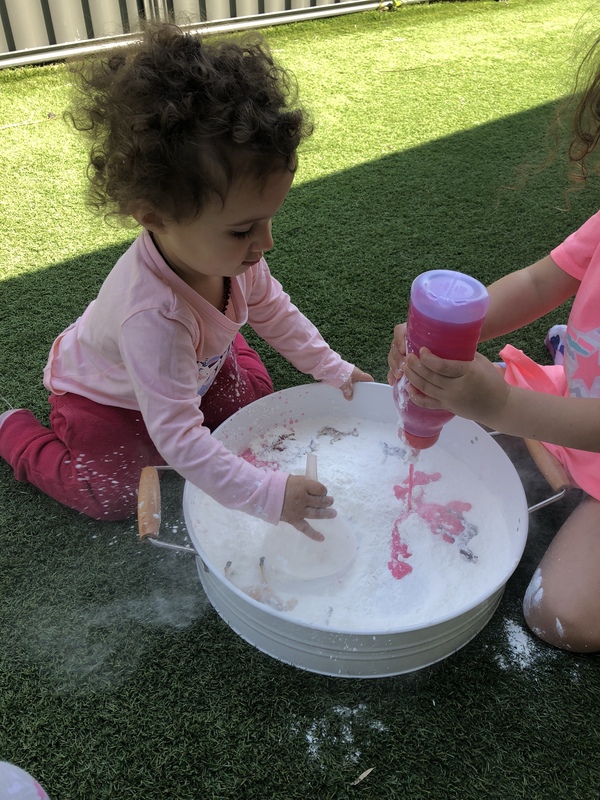 They have so much fun making messes and often make slime on our back patio.